My last blog article was of a female Great Horned Owl on her nest that I photographed while in Florida in January. If you have not seen it and the owl images, you can by scrolling down beyond this article. When I was photographing the owl, I switched my camera to the video mode, and yesterday, while stuck indoors because of the snow storm here in Virginia, I processed the video and uploaded it to YouTube. Yesterday, I also started to review and process other images from Florida, where I photographed wildlife and landscapes in the Panhandle (Carabelle), Ft. Meyers, Naples, the Everglades, Ft. Lauderdale, Gainesville, and Jacksonville. I have a lot of images to keep me busy, if I get snowed in again. The below image caught my attention yesterday. While in the Everglades, I photographed a sunset. It was not spectacular, as some sunsets can be, but it was still very beautiful and colorful. 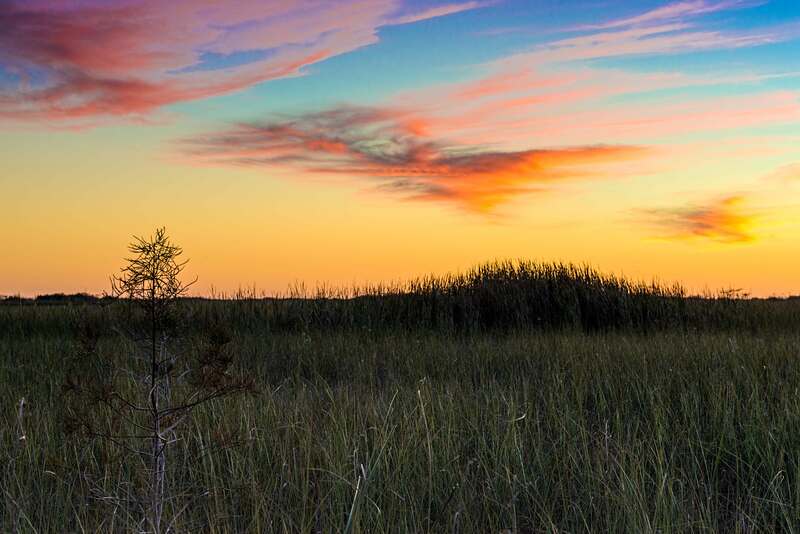 Below is one of the sunset images, looking across a sawgrass prairie in the direction where the sun had just gone below the horizon. This entry was posted in National and State Parks, Nature, Sunset, Wildlife and tagged Everglades Sunset, Great Horned Owl. Bookmark the permalink. The sky is so beautiful! It warms my heart to know that there is sun shining and no snow blowing someplace in the world! Video is a nice addition to the still images.Well done! Awesome brother.in.law…you have a wonderful eye for beauty. In a word…there is no word…way to go! Hi, I was searching for great horned owl sightings in Jacksonville fl and I came across your picture. Was this in Jacksonville? I’ve really been trying to photograph one for a long time now. All I find is barred owls and have hundreds of pics of those. Thanks! I photographed that owl in St Cloud, FL. If you find one in Jacksonville, please let me know.